It may seem odd for someone to start up a site about superhero movies without having a strong connection to comic books. The two things go hand in hand as the superhero genre started with comic books, almost all superhero films are adapted from comic books, and those that aren’t often become comic books after the fact. But I’ve said from the beginning that I’m not a huge comic book fan, I haven’t read dozens of X-men or Superman comics. In fact I can count the number of comics of either of those two that I’ve read on one hand. But that’s not to say I’ve never read any comic books. I’ve read a few, I own a few, and here is where you can get pretty much my entire experience with comics. The earliest comic book that I can remember getting is one that I still have, it’s a couple comic runs of Green Lantern and Green Arrow collected into a paperback book. It covers Green Lantern’s origin story and has some stories that at the time were pretty progressive with their stand on racial issues. I can’t say that I remember the story very clearly or how I felt about it, I don’t remember what I thought about the artwork or the action. I was always more of a reader when I was younger and while I appreciated the visual style of the comic book I tended to treat it like a book and read through it pretty quickly. That’s probably one reason why I never got into comics when I was younger, they’re just too short. I preferred to dig in to a nice Forgotten Realms fantasy novel, or later on in high school I found the hefty Wheel of Time novels by Robert Jordan. I had a friend that was more into comics, he fell for the media blitz during the Death of Superman and bought two copies each, one to read, and one to save. I remember reading through it, but I wasn’t that impressed, I was more interested in playing games on his Sega Genesis, or possibly Sega Saturn which he had for a time. It wasn’t until a bit later in life, around college, when I would start to get into comic books. I was always a fan of animation, especially Liquid Television when it ran on MTV, and one series they showed on there that I absolutely fell in love with was Sam Keith’s The Maxx. A few years later, I had gotten into Magic the Gathering and other trading card games, and the best place to buy them at that time was the local comic book shop. I was usually only there to look through their cards, but one day I was browsing through their comics and saw that they had a large collection of The Maxx comics. So I bought a few. I read them. I came back and bought some more. I eventually bought most of what they had in that collection. I loved it. It was very literary and had amazing art and unique paneling. But it still didn’t change how I read comics, I probably spent a little more time on them because the art was so great, but I still generally read them for the story, once, then moved on. Over the years I’ve read them probably 3 or 4 times all the way through. For years, that would be the entirety of my comic book collection. I got married, had a kid, moved several times. Watched a lot of TV, including a show called Buffy: The Vampire Slayer. It was after it’s run had ended, we mostly watched on I think Oxygen right after Xena. 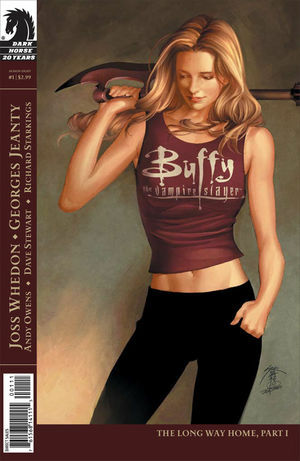 But then I got the big Buffy entire series box set on DVD and we watched through again from the beginning. We also got all five seasons of Angel and watched all of them. And then I read online that Joss Whedon was continuing the story in comic book form with season 6 of Angel. It was big, it had all the characters I loved, and it had a dragon. It was totally out there in terms of where it was going with the story and I eventually fell off towards the end of its run. But then it was announced that they were doing the same thing with season 8 of Buffy and I was in. It’s the only series that I actually bought fresh as it came out issue to issue. I wasn’t at the comic book store every month, but I was there often enough to keep up only ever having to buy maybe two issues at a time. I even bought the visual comic book on blu-ray. But then the comic book store we enjoyed going to closed down. There is one quite close to us, but the owner lives in the other half of the store, and has two cats, so the place has a constant slight odor of cat urine. So I haven’t continued into season 9. I have had a few other comic book runs that I’ve enjoyed. I am a huge Kevin Smith fan so my wife bought me the Widening Gyre which I really enjoyed. I also played City of Heroes for a long time and my wife got me several comic books created for the game. Aside from those, I think my biggest hurdle to getting into comics is the vast amount of continuity I’m missing. That and I’m also a collector at heart, it’s hard for me to start in the middle of something. The new 52 would have been a good starting point for someone like me, but it came at a time where I don’t really have a local comic book store, and I’m just not interested enough to buy them online. I would rather be able to look at them first, see if they grabbed me. For now, I’ll stick with getting my superhero fix with the movies. Until next time, this has been Bubbawheat for Flights, Tights, and Movie Nights. 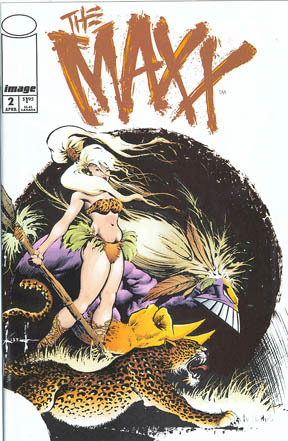 Posted on May 9, 2012, in Blogs and tagged angel, batman, Blog, buffy, comic books, Superhero, the maxx. Bookmark the permalink. 7 Comments. Yeah, there’s been quite a few comics out there that have almost caught my interest, but just not enough for me to actually hand out some cash for them. I’ve got a few characters on Guardian. I also haven’t played much recently but I still pop on every few weeks. It’s nice now that it’s free to play. I wouldn’t mind getting some more comics, but I’m ok with just the movies. Great article, Bubbawheat. I definitely understand acquiring a love of superheroes independently of the comic books. When I was a kid, I watched the Super Friends (the good runs) and Spider-Man and His Amazing Friends on TV, and played with the Super Powers action figures, but I didn’t really have any superhero comics. The local library had hardbound copies of Asterix, and those were my first comics; they had a few similarly bound copies of Marvel and DC comics, but not many. My collecting of comic books came about when I was finishing up college. For a while there I read most of the titles DC was putting out, and about half of Marvel’s. Then I got to feeling that they took up too much space and cost too much money, and got rid of them. I still have a fairly deep knowledge of the characters, I still enjoy the stories, and would like to continue to read them, but it’s just too much of a commitment. Also, I understand about the local comic book shop. It amazes me how some businesses — and comic book shops in particular seem prone to it — have no conception of how not to drive people away. Sounds like you got about 5-10 years on me. My cartoons of choice were from the 90’s with the superhero revolution started by Batman: The Animated Series. Though I do remember watching a lot of TMNT before that. I watched all of those cartoons: X-Men, Spider-Man, Iron Man, I think even Fantastic Four got a short run, or maybe another Marvel group. Good stuff. Sounds like. I watched Batman and Spider-Man once in a while, but I was older then and so it wasn’t a constant thing.